Thanks, Laurie! I really liked the idea of the outfit, but when I saw the photos I wasn't sure about the scarf... Glad you like it! I agree with Laurie! This look is Ideal for a date night! Day dates are the best. Love this classic look on you! How fun that you got away for the evening Andrea!! I love the white and blue blazer! The polka dot one is nice, too. And such a good price! I had to order it! I love that you got out for the evening! Steal those precious hours when you can! Great look and I love your blazer! Thanks, Patti! I hope you had a nice weekend! So chic and beautiful! I love the combo! Such a chic look on you Andrea. The scarf is fine, not what you think at all. I really love those sunglasses - they're cool! I fall more in love with you silver flats every time I see them. So versatile. And this whole outfit is amazing. I didn't get 'flight attendant' at all. More like classy retro 60s. Jackie O. You look perfect. Thanks, Leslie! I love the flats, too. And they were such an unexpected find. I was shopping with my older son at Banana Republic for his birthday gift last year when I came across them. I had been looking for some lace up flats for a long time. Not necessarily in silver. They were several times reduced and cost less than $12. This is a fabulous outfit on you! Love navy and white together, and the polka dots are the perfect touch! Thanks, Lana! When I bought the blazer, there were a lot of polka dots in the store, so I thought right away that I would wear it with my polka dot blouse. Thanks, Debbie! I really liked the idea of the outfit but once I saw the photos I just wasn't that sure anymore... Seems like people like the scarf (I like it, too. Just not sure if I like it with the blazer, etc.). I love how crisp and clean Navy and white is! You look fabulous! You look so chic! I love the preppy vibe of this outfit! I didn't think flight attendant...the jacket is lovely. Navy and white is always the business. 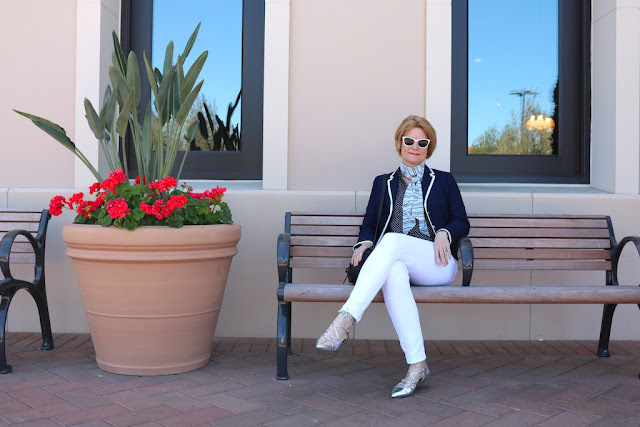 Your navy jacket suits you and goes well with the white jeans. Some free hours and a good restaurant is a good plan! What a fun look, Andrea! I totally get the flight attendant reference. Have a great weekend. Great work outfit. Your shoes are adorable. Thanks for joining the Top of the World Style linkup party. Interesting mix of patterns Andrea and they all work so well together too. You look lovely and I'm glad you and the hubby got to spend some adult time together. This is such a great look, Andrea! I am Loving that blazer. I like it with the scarf and it didn't read flight attendant to me, but I do understand we sometimes change our mind about styling once we start reviewing photos. Also, I am a huge fan of navy and white. Thanks for linking up, Andrea!